Monday is already the crappiest day of the week, so it only makes sense that we make things official. 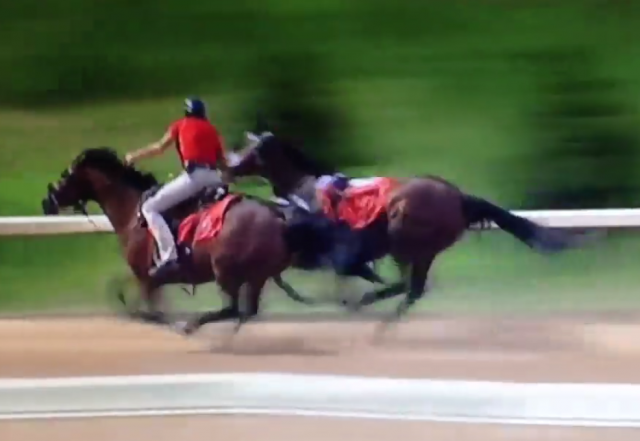 Here’s our latest “oh crap” video — with a happy ending, thanks to a heroic outrider! Outriders have one of the gutsiest jobs in the horse world: when everything is going well, you might only barely notice their presence on the track. But when the manure hits the fan, the outrider springs into action, and it’s his or her reflexes and judgement of a situation that can prevent calamity from striking. A couple of day ago, the camera crew was able to video a catch of mine. ?Thought I would share with everyone ! So proud of BB!! Outriders have just moments to read a situation and act to keep horses and people safe, and luckily for this filly, Nadine and BB timed this rescue perfectly! Our hats are off to the hardworking outriders of the racetrack.